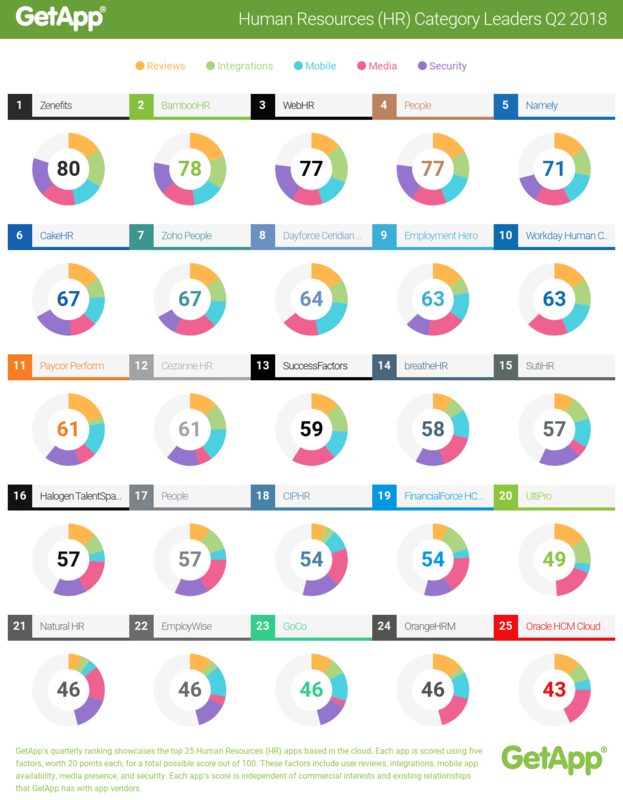 In the Q2 GetApp HR category leaders’ compilation, CakeHR climbs up a spot to grace #6! While you were reading the headline of this piece some enthusiastic entrepreneur decided to introduce yet another Human Resource solution to the 14 billion dollar market! Fast fact: 57% of companies plan to make a major new HR software purchase in the next 18 months. But it can’t be denied that HR is a hot topic right now. And in the midst of the intense competition, holding on to the mantle of GetApp vetted Top 10 HR Category Leader is no mean feat. CakeHR has been part of the GetApp compilation consistently for the past 2 years. Quarter after quarter you’ve read the happy news and popped the bubbly with us. What Does This Achievement Mean for Our Clients & Community? GetApp is the ultimate mouth piece of customer satisfaction. It boasts 250,000 plus reviews of 7000+ software solutions. And it recognizes 286 unique HR products. Yet only 25 make the cut. That’s a mere 9% of the available solutions. The fact that HR management software CakeHR is a regular underlines and highlights the fact that we have managed to master a tricky mix. We bring much needed, glitch-free features like leave management and organization chart to the table. But at the same time, CakeHR reduces overwhelm by passing up needless bells and whistles and it makes HR more human with a friendly, tireless support that puts users first! If you compare this quarter’s performance to last quarter’s success, you see an increase of 2 points in the cumulative tally – from 65 to 67, out of a possible 100. However, there is something else worth drawing attention to. CakeHR is one of the only two tools to score a whopping 18 in the category of Security. We deal with sensitive employee information and we prioritize giving businesses and their talent a safe, protected environment to grow and collaborate in. GDPR, ePrivacy and a slew of data concerns are on the horizon! We are aware and actively compliant. GetApp is not random in its selection of these category leaders. A lot of thought and a robust algorithm facilitate their selection. We have covered these criteria in previous briefings but would like to touch of them again for new readers. Reviews fuel the GetApp engine and feature prominently in their vetting process. However, GetApp doesn’t stay local. It sources reviews and ratings from its sister sites – Software Advice and Capterra as well to eliminate any chances of bias or manipulation. It determines a category average for reviews. It then calculates the rating average for the software solution being evaluated. Integrations are essential. In an interconnected world, apps need to communicate with each other – securely – to be of optimal use to businesses. The integration criteria in GetApp has a total of 20 points. First the number of integrations a solution has is compared to the category average. This yields up to 10 points. Next it is compared to the integrations array of category leaders. An additional 4 points can be secured at this juncture. 5 points are awarded if a solution integrates with Zapier – a webhook platform. And an extra 1 point is for having an open API. Mobility is flexibility and it is no longer a luxury. GetApp category leaders must have a strong presence in the domain of mobile apps. 5 points are reserved each for the availability of iOS and Android applications. The remaining 10 points depend on the number and the average rating of reviews in the App Store and Google Play. Media Followers don’t seem particularly relevant to how effective an HR solution can be. But think of it – Human Resource is the skill of managing human relationships. 15 points are awarded by scaling the combined number of Twitter followers and Facebook fans against the category average. 5 points are secured by scaling this number against the following of category leaders. We argue that this is by far the most important criterion in a qualitative sense. If a solution improves its security, in our opinion, it has the best chance of getting brownie points in the subsequent quarter’s compilation. 15 points are awarded for the answers to the 15 questions in the Cloud Security Alliance self-assessment form as part of the Security, Trust & Assurance Registry. If a vendor goes above and beyond and secures additional security certificates, it can grab 5 more points for a maximum total of 20! We make it a habit to celebrate every win – big and small – with our users. They inspire us to do better. They inspire our in-app innovations with their guidance and feedback. And they help us spread the message of a more human and simple way of doing HR through their generous reviews. Here’s looking at our international user base. We may be spread out all over the world but we are united by the common thread of making work more collaborative and purposeful. Gee Whiz, We Can Do That Now?